There are un-countable numbers of people who do exactly what I do (or if not exactly, then, similarly). One thing we all have in common is symbolism. Every person on the planet sees signs. NOT every person acknowledges them. And amongst those of us who do, we couldn’t possibly acknowledge every single one of them. The very significance of them all is where we learn. We understand what one item or scene means, to us, in our frame of reference. Building that virtual warehouse of symbols and signs is gaining knowledge, in ourselves and in our world. When I wake up every (or nearly every) morning with a message in my head, it’s usually connected to some sort of images that I was shown. But it could be words or feelings. All of this is: symbolism. Finding them is easy, figuring out what they’re telling us can be more challenging. Well, it can be. Or, it can be no problem at all. 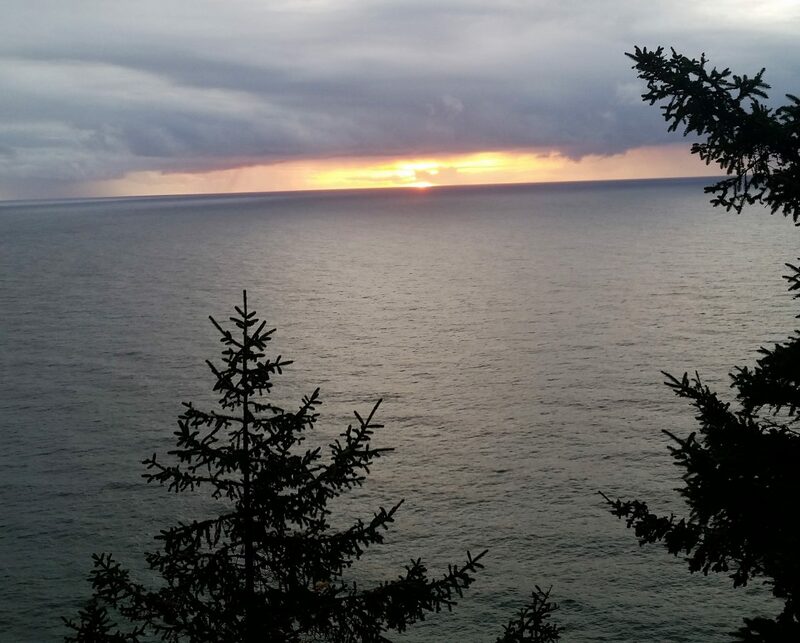 One way to better comprehend what is being shared with us is to let go of the busy-ness in our heads. Become Still. Allowing ourselves to listen. As with our daily draw. When we hear this definition, do we struggle against it? Do we fight it? Question it? Or do we listen, and accept it? The world around you is simply a reflection of your inner world, beliefs, and feelings. There is a person or group of people in your life at present who keeps putting you down and undervaluing what you say or do. 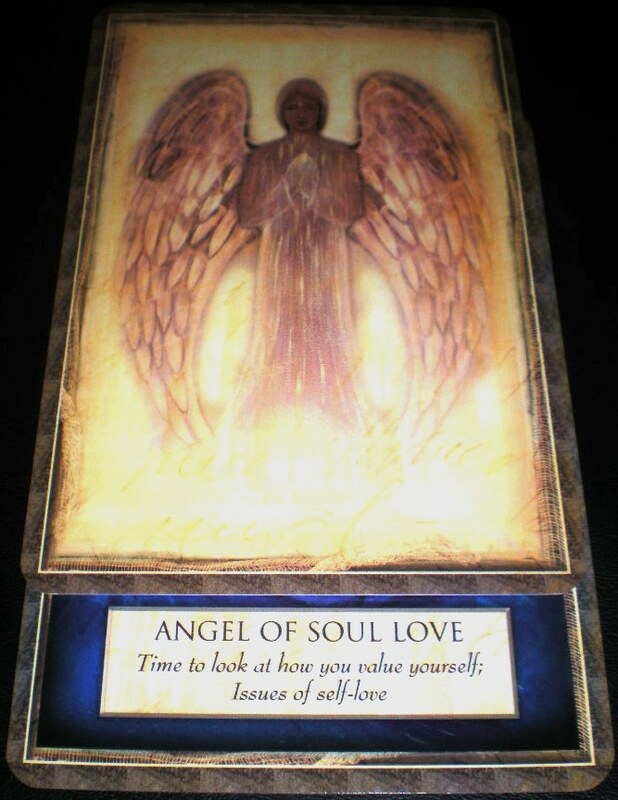 The Angel of Soul Love realises that this is a painful and hurtful situation for you and has shown up in your reading today to help you work through and heal this issue. From a higher perspective, all happens as an act of love. The people in your life at present are simply here to help you face your own feelings of inadequacy, self-worth, and self-love. That is not to say that you should pat them on the back for making you feel small or sad, rather it is the opposite. Stand up for yourself regardless of what others think or say and know that you are eternally worthy of love. In essence, you are a wondrous and beautiful being of light and love. You are held in eternal embrace by the soul of creation, loved and valued more than you will ever know. Start to have loving thoughts for yourself; you are perfect just as you are. There is no need to change anything about you except for the perceptions you hold about yourself. And we need to ask, what signs is the Universe sending us? Our validations are going to show up, in a variety of ways. All we need to do is acknowledge them, and be thankful for their appearance. is this bad phone photo from a parking lot (I blame the annoying people who were walking past as I was trying to get the shot). It was directly in our path tonight. 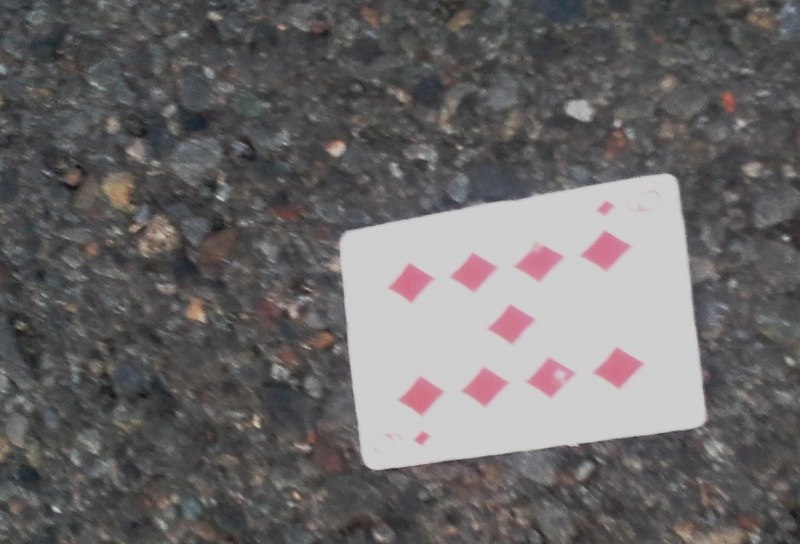 Finding a playing card is always significant. It’s almost like we are being handed a physical piece of signage. A placard, or manifested announcement. As I said earlier, they’re out there. And because I sometimes like to go a-googling, to see what’s new in my field, I discovered this brilliant description. Making our sign even better. I am getting better at spotting signs. But figuring them out? Not so much. I have gotten a lot of feathers over the past couple of weeks. Didn’t even -think- of a possible number association. 😦 *shakes head* I got two sets of two feathers, both by my laundry lines and one set of a large feather with 3 smaller feathers by my basement door. Normally I only get singles. Guess a little poking around is in order. And maybe I should check out animal symbolism. One set was a Blue Jay and Crow feather. Thanks for the reminder to look in more than one direction. It was definitely needed! No clue where your first comment went, but let me tell you, it was an odd day all around. Not just you, I promise!